The video was created from a variety of still images stitched together to form a panorama on December 19 of last year. 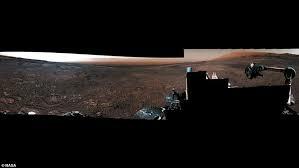 NASA has just released the footage online and it shows images of Curiosity’s next destination, the floor of Gale Crater. Curiosity’s most recent drilling site, dubbed the Rock Hall Drill Hole, can be seen as well as the previous Highfield drill site, and the Gale Crater Rim and Floor. It also shows Upper Mount Sharp in the distance and the area where Curiosity will be moving to study next, called Glen Toridon, a ‘clay-bearing’ region. The term ‘clay-bearing’ means data from orbiters shows that rocks there contain clay minerals which form in water. Curiosity’s journey and analysis of the Vera Rubin Ridge could help NASA to piece together the story of its formation.